What is Regaine for men? 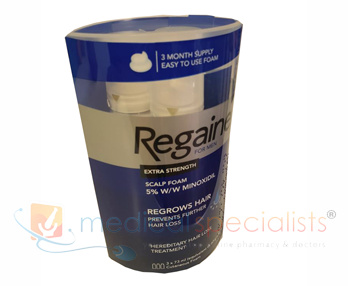 Regaine contains the active ingredient minoxidil, which is clinically proven to help prevent further hereditary hair loss, showing success in 4 out of 5 men. It works by increasing the blood supply to the hair follicles which helps to strengthen existing hair and stimulate secondary hair growth. For most men, using Regaine even reverses the process, resulting in regrowth. Regaine should be applied to the scalp twice a day to help kick start your follicles.The easy to use foam takes very little time to apply, means it seamlessly fits into your daily grooming routine. In hereditary hair loss, a combination of heredity, hormones, and age causes a progressive shrinking, or miniaturization, of certain scalp follicles. This causes a shortening of the hair's growing cycle. Over time, as the active growth phase becomes shorter, the resting phase becomes longer. Eventually, there may be no growth at all. The exact mechanism of action of Regaine is uncertain. However, researchers believe that Regaine works in part by partially enlarging the hair follicles and reversing the miniaturization process. By enlarging miniaturized follicles, the growth phase of the hair cycle is prolonged, allowing the hair to become longer and thicker looking. And with more follicles in the growth phase at the same time, it is possible to see improved coverage of the scalp. You can buy Regaine online with or without a prescription at Medical Specialists, after completing a simple online consultation. Just complete an online consultation by clicking the orange button above. We are the UK’s leading supplier of hair loss treatment, and Regaine for sale in the UK. For full patient information, please read or print out the leaflet provided at the bottom of this page about Regaine. Flushing of the scalp skin due to widening of the small blood vessels (erythema). Unwanted growth of hair on other parts of the body. Don’t know why you’re losing your hair – see your doctor. Have other conditions associated with hair loss. Are using any other medications on your scalp.